This is a stunning suite we designed and produced. It is classic Arts & Crafts in style, with a strong Voysey look, & some small influence from his contemporaries Stickley, Mackintosh, Baillie-Scott, etc. The long strap hinges are classic Voysey. The suite comprised of a large dining table, 2 carver and 4 dining chairs, a sideboard and 2 glass display cabinets. The furniture was all in Oak, with a lacquered and hand waxed finish. One look will reveal the unity of design and attention to detail throughout. This is an example of the quality of design and finished work we can produce to commission. For furniture of this quality we usually allow approx. 12 - 14 weeks to produce it. 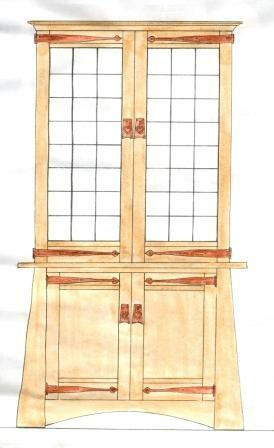 The sideboard, & display cabinet, sloped ends took their inspiration from the buttresses used on many of voysey's houses! The use of natural colour oak, the Shaker panelled doors & long strap hinges establish the Voysey look. 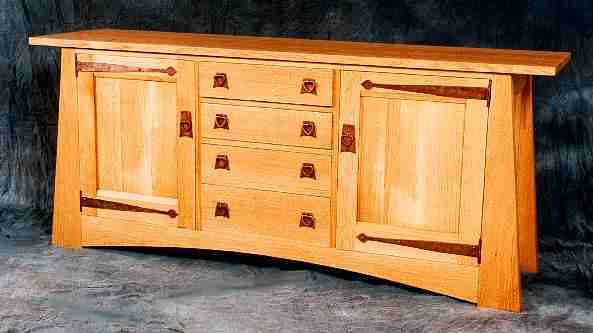 Voysey also used curves a great deal in his architecture & furniture, so we incorporated a sweeping curve profile to lighten the overall mass of the piece. The curved detail was incorporated into all of the pieces. The display cabinet incorporates all of the same detailing as the side board. A nice cornice carries on Voysey's style. The doors are quite heavy with leaded glass panels, using the rippled glass favoured by Arts & Crafts designers. The top half is for display and includes glass shelves and lights inside the top, to highlight displayed items. We actually made a narrow version of this, shown above LH, as it had to fit a tight space. Later the client decided they would like another wider one for a different room (see design above RH). 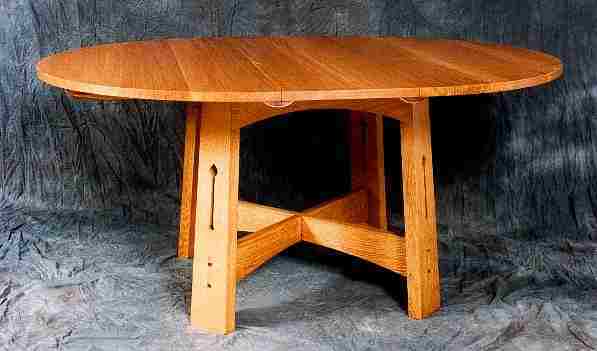 The circular top can be opened up to add another middle leaf, making a large table to sit 6 people. The top was extendable with a 14" spare leaf. The bottom rails are curved to match the rest of the pieces. 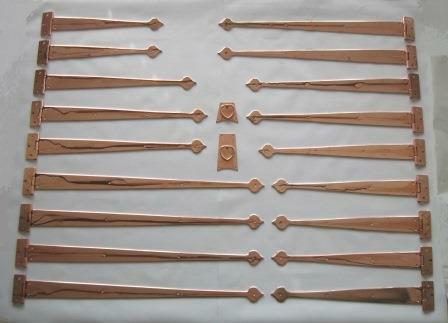 A cut-out detail was added to each leg, the shape of which echoes the strap hinges. A lovely little design touch was added where the bottom rails tenon through the legs & are visible ('revealed contruction' ala Pugin); walnut wedges were used to lock the joints & echo the antique copper colour of the fittings. The same use of walnut wedges was used on the carver chair arms. Shown above are the carver & dining chairs produced for this suite. 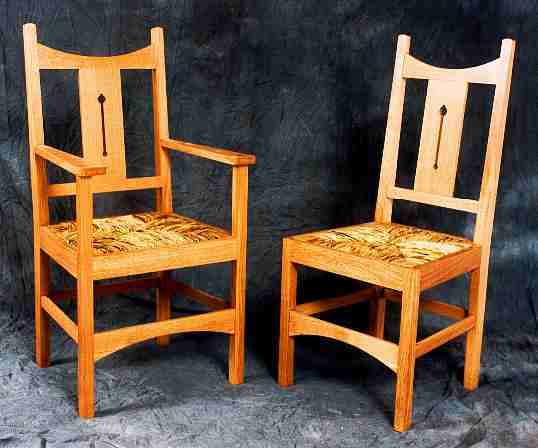 The chairs are based exactly on Voysey's classic chairs (with the heart cut-out back splats). The back panel here was lengthened to give it more of the flavour of Voysey's Essex & Co. chairs. The cut out design in the backs matches that of the table, both of which echo the strap hinges on the two cabinets. The top back and lower front rails are curved to match the rest of the suite. Where the carver chair front legs tenons pass thru the arms rests there are small walnut wedges, to echo the table same detail. The drop-in seats were hand rushed for the authentic Arts & Crafts look, but leather or other upholstery materials would be equally suitable. Follow the photo link above to see more photos of the beautiful metalwork used for this furniture.